But when treachery forces the rebel ship to flee into territory controlled by pirates, Leia makes a shocking discovery: the fierce marauders come from Leia’s homeworld of Alderaan, recently destroyed by the Death Star. These refugees have turned to pillaging and plundering to survive — and they are in debt to a pirate armada, which will gladly ransom the princess to the vengeful Empire… if they find out her true identity. 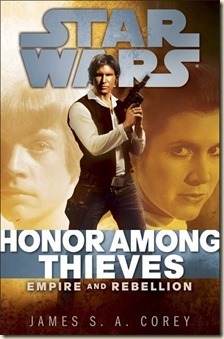 Struggling with intense feelings of guilt, loyalty, and betrayal, Leia is determined to help her wayward kinspeople, even as Imperial forces are closing in on her own crippled ship. 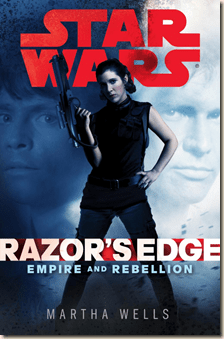 Trapped between lethal cutthroats and brutal oppressors, Leia and Han, along with Luke, Chewbacca, and a battle-ready crew, must defy death — or embrace it — to keep the rebellion alive. The book, set in the classic era, is a stand alone adventure and is scheduled for publication in Spring ’14. Our editor-at-large, Shelly Shapiro, received the manuscript last week and posted on this page the other day “I am super enjoying the Star Wars manuscript I’m reading right now.” I loved Corey’s LEVIATHAN WAKES so I’m very excited to read this Han and Chewie romp through the GFFA.